There are a number of possibilities as to why folders cannot be deleted but this one I came across recently got my attention. 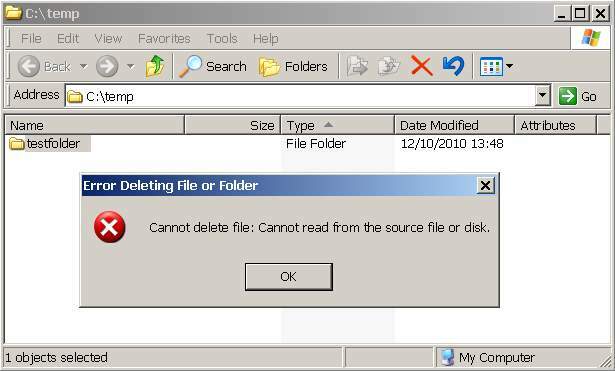 While decompressing a zip file it created its extracted folder but when I came to remove the folder it came up with the error “Cannot delete file: Cannot read from the source file or disk”. After investigating I realised that it had a trailing space at the end of the folder. Now I knew what was causing the removal to fail but how to get rid of it? Below is an example code which creates a folder called “testfolder” in C:\TEMP with a trailing space. Note that after the space \\ is required for it to create the space after the folder. Once compiled and run it will create the testfolder, pause for 5 seconds and then remove it. The trailing space can be more than just one space character. Examples on how to delete trailing space folders from the console.